The 2012 Olympic Games might be based in London this year, but the official car sponsor is distinctly German, with BMW supplying all the official games vehicles. Still, Brits can take some solace that a selection of MINIs make up part of the fleet, adding a traditional touch to the games. Forty of those are electrically-powered too, with a selection of MINI Es. Now, more electric MINIs have joined that list... though they're a little smaller than you might expect. In fact, they're so small you might have missed them. The electric remote control vehicles are being used to pick up javelins, discuses, hammers and other throwable items from the field events, saving time for atheletes during the competition. Like the official vehicles, even the smallest additions have to meet certain criteria, ensuring they serve an adequate purpose during the games. That means being able to carry a load of up to 8kg (17.6 lbs)--the weight of a hammer, discus or shot, or two javelins. They also need to be simple to operate, with minimum technical support (no breakdowns here), and use batteries that can support 35 minutes of continuous use, a radio control range of over 300 feet, and be recharged in 80 minutes. 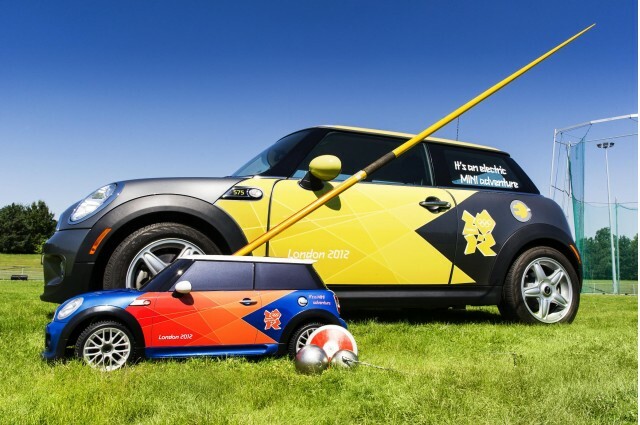 Each car is roughly quarter scale and specially designed for the Olympics. They may be small, but the role they're playing is as important as any other in the official olympic fleet. Best of all? They're zero-emissions, of course!